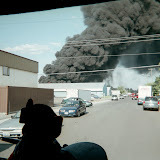 Today, May 13, 2012, the Spokane Fire Department responded at approximately 3:16 PM to 406 East Montgomery on a reported structure fire. The first crew to arrive on scene, Engine 2 from the local neighborhood fire station, reported smoke showing from the roof of a 2-story- wood framed apartment building with a fire reported in a 2nd floor apartment. Engine 2 along with assistance from several neighborhood civilians, used ground ladders to rescue 2 trapped occupants from a window on the second floor. Firefighters from Engine 2 with the assistance from additional firefighters from Engine 3 then made entry into the structure and aggressively attacked the fire located in an apartment on the south east corner of the 2nd floor. Additional fire crews completed search and rescue, evacuation, ventilation and salvage and overhaul. The fire was brought under control within 30 minutes and there were no reported injuries to the occupants or firefighters. Nine fire companies with 31 firefighters responded to this fire and were on scene for approximately 3 hours. The cause of the fire is under investigation by Spokane Fire Department Special Investigation Unit. Fire and smoke damage was confined to the 2nd floor apartment.